Big Society NHS | We are the Big Society NHS and we think the NHS reforms stink. Medsin are calling for the Health and Social Care Bill to be dropped. 3) Share the link far and wide! I would love to think that the Lib Dems spend their free time the same way that I do: fretting over the future of the NHS and the health of our society. It saddens me to say that I don’t think this is the case. My trust in democracy, my belief in an elected government that keeps it’s promises has long been destroyed. Nevertheless I cannot lose my faith in human conscience. If Labour are only figthing the NHS’ corner because it will win them election points, right now I don’t care. They are saying (some) things I want to hear, and now I want the Liberal Democrats to prove that they still have human consciences’. We, the people, it seems do not have the power to influence any decisions the government make. The Lib Dems still do and it is time to put people before power. Write to your (or someone else’s) Lib Dem MP Now and ask them to vote against the Bill. Please get involved, and get your friends involved too. So the Health and Social Care Bill has reached the Report Stage in the House of Lords and it’s taken a beating already! The Coalition Government have lost the first vote and it’s a sign of things to come. The amendment that was passed creates a duty for the health secretary to promote a health service that deals with “mental and physical illness”, rather then the original draft of just “illness”. More professional organisations have come out against the Bill such as the Faculty of Public Health and the Community Practitioners and Health Visitors Organisation, and Labour has started to up its game. 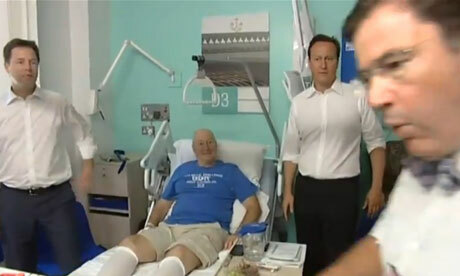 Cameron was seriously mauled by Ed Miliband in PMQs and have even taken to smearing Dr Gerada, President of the RCGP in an attempt to discredit those who are fighting hard to Save the NHS. There is a demo on 7th March in London where there will be plenty of people singing this song (the You Tube video below) so make sure you learn the words! The trio of ministerial ‘reformers’ to the NHS could be about to witness new challenges to their toxic proposals to overhaul our health service. In a fortnight of breaking news on almost daily updates in the saga of the NHS reforms, news now comes that a previously-concealed document – the ‘Risk Register’ may have been leaked out into the open. With its release comes some devastating pieces of information that may challenge Lansley’s NHS upheavals once and for all. The Risk Register was developed for the Department of Health as an internal breakdown of risks and issues the Health and Social Care Bill could pose to the healthcare service. Despite widespread calls for its release into the public domain, Lansley and the DoH staunchly refused, citing claims its findings would be “misleading“. With even the Information Commissioner ruling the DoH was breaching the Freedom of Information Act by failing to disseminate the document, the DoH seemed able to stand up to criticism and conceal its potentially incendiary findings. Claims now exist from leaked elements of the report that it refers to an upcoming huge “surge in health care costs and that the NHS will become unaffordable” as private companies siphon money to their interests. The report apparently goes on to warn that GPs, who the Health Bill proposes shall take over healthcare commissioning, have no experience or skills to manage these costs and tasks effectively. It will be difficult if these claims stand true for Lansley to brush off criticism that his reforms are unnecessary and over-costly. It is clear from the spread of opposition that the Bill gains day by day that the next week that winning the debate in the Lords and Westminster will be no easy task for the govermnement. It is crucial at this time that we mobilise together to put an end to these reforms once and for all. With the BMA, the RCN, the RCGP, many of the other trade unions and medical colleges, along with hundreds if not thousands of other members of the public now standing in the way of Lansley’s backdoor privatisation of the NHS we see little chance these reforms can pass successfully into legislation. Join us over the next week in standing up to power and keeping the NHS run for the public, by the public! Are you worried about these allegations? According to the government, their recent embarrassing defeats in the House of Lords over the Welfare Reform Bill flew in the face of public opinion. They claimed that most of the British population agree that people should get their benefits capped and less spent on the welfare state. This may or may not be true, but when did the government ever take peoples opinion into consideration on big blockbuster policy? I know they’re supposed to. “We’re in a democracy, blah blah blah…”, but when it came to the Iraq War, a million people on the streets of London did diddly-squat to ‘pause’ the illegal crusade (yes, I realise this was a different government). So, Cameron, Clegg and Co will listen now? They didn’t listen when it came to the tuitions fees rises. Will they consider the opinions of the half a million members of the public who have signed the 38 Degrees petition against the Health and Social Care Bill? Or the huge numbers of healthcare professionals who have come out in opposition to the £4 billion NHS re-disorganisation? Ah, but of course, the ‘listening exercise’. They paused, they listened, and I’m sure they even slept on it, BUT THEY STILL DIDN’T DO ANYTHING ABOUT IT! Remember this? Mr David Nunn, orthopaedic surgeon unleashing his wrath on Clegg/Cameron's entourage who did not roll their sleeves up no doubt. Perhaps more medical mirth to come? Don't let matron see you up to no good Lansley. The government are adamant that they will continue to hide the full facts about the reforms and push them through the House of Lords. Is this because the government know something about what the public want? The public want to see the health service gradually eroded by more private providers who will push the NHS out of business? The public want to see £4 billion wasted on these reforms that do not have the support of NHS workers and healthcare professionals? The public want to see legislation that will allow patients to be charged for their healthcare? And for the government to no longer have responsibility for providing a comprehensive health service? Cameron ought to wash his hands of Lansley's Health and Social Care Bill and save the prospects of Tory success at the next election. Perhaps we could see similar defeats for the Health and Social Care Bill when it is debated and voted on in the House of Lords in February. But we must keep up the pressure on the peers and our MPs. By-eck, we should be even be learning from UK Uncut and co. and stepping up the pressure with a campaign of civil disobedience! The pressure is working, and it’s making Tory MPs quake in the back benches more than on the back seats of a high speed train rumbling through the Home Counties. We must defeat this bill, or face a headlong rush towards a health service that could charge us for medical care, that will see less efficient management through more private providers wanting a share of the pie, the postcode lottery 2.0, and we would certainly not have an integrated health and social care system (despite the name of the bill). Hello to US-style healthcare. The ConDem coalition must listen: doctors, nurses and midwives now all oppose the bill and want it stopped. Initially the major unions were attempting to negotiate with the Government, however this morning they have united in their complete opposition to the Health and Social Care Bill. The Royal College of Nurses argue that “serious concerns expressed by members have not been addressed“. In addition they call the bill “a serious threat to the NHS” due to recent changes such as the increasing number of private patients that could be treated in NHS hospitals. The Royal College of Midwives has also come out this morning calling for the Bill to be “scrapped” in it’s entirety. Cathy Warwick, Chief Exec of the RCM, said “Breaking up what we have, embracing the private sector, and injecting full-blown competition and market forces is not what the NHS needs or what health professionals and patients want…We join the growing chorus of voices calling for the bill to be withdrawn, and the proposed reforms stopped in their entirety.” And on this point Big Society NHS couldn’t agree with her more. The British Medical Association also calls for the Bill to be rejected completely. Chair of the BMA, Hamish Meldrum, wrote in the Guardian this week stating that the Bill must be dropped and that it “will result in widespread fragmentation of healthcare and work against integration with social care, not to mention the massive cost and destabilisation caused by yet another major reorganisation at a time of huge financial pressures“. The Government must listen to them, to continue with the Bill in face of such blanket opposition would be arrogance and idocy in the extremest form.